Scientist/Engineer-SD (Post Code 1353) :- 1. Ph.D topics related to Aerosols/Atmospheric Modeling/Radiation Transfer Modelling/Planetary Science & Exploration/Microwave Remote Sensing/Ionosphere Modelling with 2. M.Sc Physics/Meteorology/Atmospheric Science/Space Science or equivalent. OR B.E/B.Tech/M.Tech/MS in Electronics/Electrical/Mechanical/Civil Engineering/Computer Science/Earth Science or equivalent. Scientist/Engineer-SC (Post Code 1354) :- 1. M.E/M.Tech or equivalent in Industrial Safety Engineering in First Class with an aggregate minimum of 60% marks (average of all semesters) or CGPA/CPI grading of 6.5 on a 10 scale or equivalent. 2. B.E/B.Tech or equivalent in Mechanical Engineering/Industrial Engineering/Chemical Engineering/ Electrical Engineering in First Class with an aggregate minimum of 65% marks (average of all semesters) or CGPA/CPI grading of 6.84 on a 10 scale or equivalent. Scientist/Engineer-SC (Post Code 1355) :- 1. M.E/M.Tech or equivalent in Metallurgical Engineering/Material Science/Industrial Metallurgy in First Class with an aggregate minimum of 60% marks (average of all semesters) or CGPA/CPI grading of 6.5 on a 10 scale or equivalent. 2. B.E/B.Tech or equivalent in Mechanical Engineering/Metallurgy Engineering in First Class with an aggregate minimum of 65% marks (average of all semesters) or CGPA/CPI grading of 6.84 on a 10 scale or equivalent. Scientist/Engineer-SC (Post Code 1356) :- 1. M.E/M.Tech or equivalent in Micro Electronics in First Class with an aggregate minimum of 60% marks (average of all semesters) or CGPA/CPI grading of a minimum of 6.5 on a 10 scale or equivalent and 2. B.E/B.Tech or equivalent in Electronics & Communication Engineering/Electronics Engineering/Electrical Engineering in First Class with an aggregate minimum of 65% marks (average of all semesters) or CGPA/CPI grading of 6.84 on a 10 scale or equivalent. Scientist/Engineer-SC (Post Code 1357) :- 1. M.E/M.Tech or equivalent in Micro Electronics in First Class with an aggregate minimum of 60% marks (average of all semesters) or CGPA/CPI grading of a minimum of 6.5 on a 10 scale or equivalent and 2. B.E/B.Tech or equivalent in Electronics & Communication Engineering/Electronics Engineering/Electrical Engineering in First Class with an aggregate minimum of 65% marks (average of all semesters) or CGPA/CPI grading of 6.84 on a 10 scale or equivalent. Scientist/Engineer-SC (Post Code 1358) :- 1. M.E/M.Tech or equivalent in Surface Engineering/Surface Science & Technology/Surface Coating Technology in First Class with an aggregate minimum of 60% marks (average of all semesters) or CGPA/CPI grading of a minimum of 6.5 on a 10 scale or equivalent and 2. B.E/B.Tech or equivalent in Mechanical Engineering in First Class with an aggregate minimum of 65% marks (average of all semesters) or CGPA/CPI grading of 6.84 on a 10 scale or equivalent. OR M.Sc Physics/Chemistry in First Class with an aggregate minimum of 65% marks (average of all semesters) or CGPA/CPI grading of 6.84 on a 10 scale or equivalent. Scientist/Engineer-SC (Post Code 1359) :- 1. M.E/M.Tech or equivalent in Chemical Engineering with specialization in Process Design/Process Engineering in First Class with an aggregate minimum of 60% marks (average of all semesters) or CGPA/CPI grading of a minimum of 6.5 on a 10 scale or equivalent an 2. B.E/B.Tech or equivalent in Chemical Engineering in First Class with an aggregate minimum of 65% marks (average of all semesters) or CGPA/CPI grading of 6.84 on a 10 scale or equivalent. Scientist/Engineer-SC (Post Code 1360) :- 1. 1. M.E/M.Tech/M.Sc (Engineering) or equivalent in Control Systems Engineering/Control & Instrumentation/Control & Guidance/Control & Computing/Control & Automation/Systems & Control Engineering in First Class with an aggregate minimum of 60% marks (average of all semesters) or CGPA/CPI grading of a minimum of 6.5 on a 10 scale or equivalent and 2. B.E/B.Tech/B.Sc (Engineering) or equivalent in Electrical Engineering/Electrical & Electronics Engineering/Applied Electronics/Electronics & Communication Engineering /Electronics & Instrumentation Engineering /Aerospace Engineering in First Class with an aggregate minimum of 65% marks (average of all semesters) or CGPA/CPI grading of 6.84 on a 10 scale or equivalent. Scientist/Engineer-SC (Post Code 1361) :- M.Sc. Chemistry/Applied Chemistry with specialization in Polymer Chemistry/Organic Chemistry in First Class with an aggregate minimum of 65% marks (average of all semesters) or CGPA/CPI grading of a minimum of 6.84 on a 10 scale or equivalent. Scientist/Engineer-SC (Post Code 1362) :- 1. M.Sc Mathematics with specialisation in Linear Algebra/Graph Theory/Operations Research/Probability in First Class with an aggregate minimum of 65% marks (average of all semesters) or CGPA/CPI grading of a minimum of 6.84 on a 10 scale or equivalent. Scientist/Engineer-SC (Post Code 1363) :- 1. B.E/B.Tech or equivalent in Engineering Physics in First Class with an aggregate minimum of 65% marks (average of all semesters) or CGPA/CPI grading of 6.84 on a 10 scale or equivalent. Scientist/Engineer-SC (Post Code 1364) :- 1. B.E/B.Tech or equivalent in Chemical Engineering in First Class with an aggregate minimum of 65% marks (average of all semesters) or CGPA/CPI grading of a minimum of 6.84 on a 10 scale or equivalent. Medical Officer-SC (Post Code 1365) :- 1. MBBS / equivalent from a recognised University registered with Medical Council of India. 2. Minimum 2 years clinical experience in a reputed hospital. equivalent. There will be a non-refundable application fee of Rs.250/- (Rupees Two Hundred and Fifty only) for each application. Fee may be paid online through Credit Card / Debit Card / Internet Banking only through SBI ePay facility . No other mode of payment will be acceptable and the fee will not be refundable under any circumstances. Female/Scheduled Castes (SC)/ Scheduled Tribes (ST)/Ex-serviceman [EX] and Persons with Disabilities (PWD) candidates are exempted from payment of Application Fee. Please note that the applications of non-exempted categories without Application Fee will not be considered. GET FREE JOBS ALERT ON WHATSAPP. SAVE THIS MOBILE NUMBER (9277772272) ON YOUR PHONE AS JOB ALERT. NOW SEND WHATSAPP MESSAGE "ADD ME & YOUR STATE NAME". 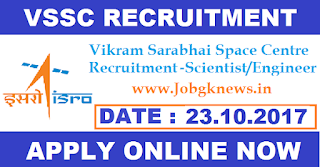 Interested and eligible candidates may apply online through VSSC careers page at official website www.vssc.gov.in from 09-10-2017 to 23-10-2017.